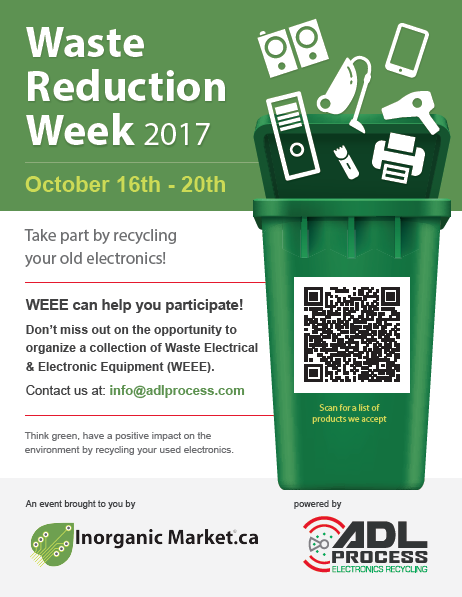 WEEE* would like to make it easy for you to participate in Waste Reduction Week 2017. If you or your organization wants to have a positive impact on the environment by organizing an e-waste collection event Oct. 16-22, we can provide you with all the logistic and support needed. Waste Reduction Week is a Canadian program focused on raising awareness, and educate the community on how circular economy works, how to develop positive habits to reduce waste and ensure resources are used efficiently. This program was created in 2001, in an effort to organize nationally the provincial events that were held by recycling councils and environmental organizations since the 1980’s. Waste Reduction Week is now spearheaded by the Recycling Council of Ontario. ADL Process shares the RCO (Recycling Council of Ontario) belief that society must minimize its impact on the environment in eliminating waste by informing and educating all members of society about waste generation, waste avoidance, the more efficient use of resources; as well as the benefits and consequences of these activities. 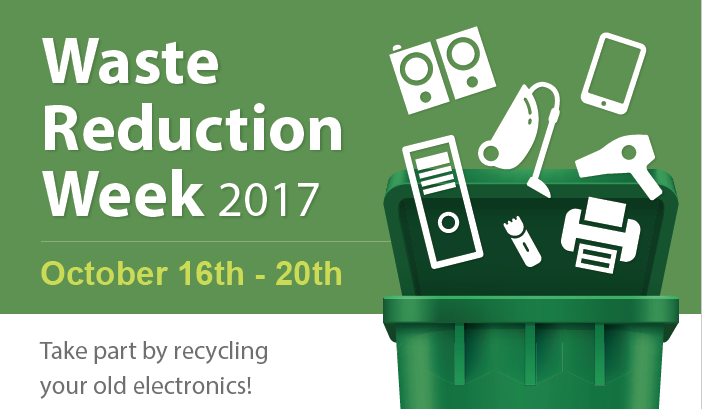 In this, we are very happy to provide the logistics and support for property managers, companies and organizations to organize electronic waste collection events to contribute to Waste Reduction Week 2017. ◊ We guarantee 100% privacy, your information will not be shared, and we will only send relevant information. You can unsubscribe at any time.